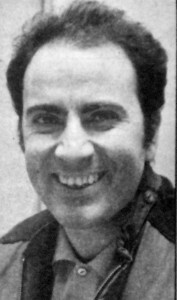 Manuel Puig (b. 1932 General Villegas) was an Argentine author. His novel El beso de la mujer araña (1976) (Kiss of the Spider Woman) was made into a film, and in 1993 it was made into a Broadway musical. Puig has written novels, plays, and screen plays. His best known novels include La traición de Rita Hayworth (1968) (Betrayed by Rita Hayworth), Boquitas pintadas (1969) (Heartbreak Tango).